This alliance however, didn’t only come with benefits. The Iroquois tribes being cut out of this trade partnership that Champlain had with their longtime rival tribes greatly angered them, which sparked a war between the tribes. After being asked by his Algonquin and Huron allies for help in this battle, Champlain agreed, out of knowing that he could not survive in this land without his native allies. He set out on a voyage with his Algonquin and Huron friends to intercept the Iroquois, and after days of traveling they met them in battle. 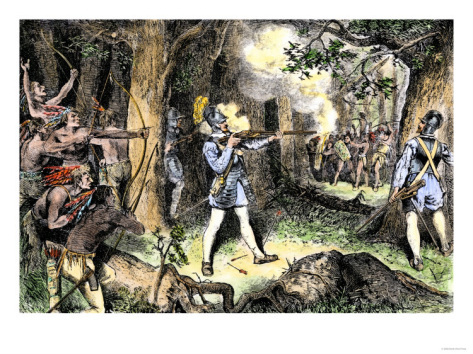 Champlain and his allies won the battle, and caused the Iroquois to retreat into the forest. This victory marked an important moment in French Canadian identity, because it showed that Champlain was able to stand up for his native allies. While the British, and years later the Americans, lied to, killed, and stole land from the natives, Champlain respected and helped them. It helped the French establish a strong relationship with the natives which remained throughout the history of New France, long after Champlain was gone. However, on this day he also made enemies with the Iroquois, who then had conflict with the French for years. For decades after, the Iroquois tribes terrorized French settlers, by raiding their towns and homes, which caused many problems to New France, with many french settlers living in constant fear of their safety.